In 1848 a wave of revolutions swept Europe and brought an end to the Bourbon monarchy. 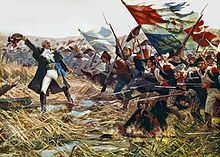 The army was largely uninvolved in the street fighting in Paris which overthrew the King but later in the year troops were used in the suppression of the more radical elements of the new Republic which led to the election of Napoleon's nephew as president. 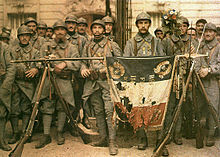 The French army was now considered to be an example to others and military missions to Japan and the emulation of French Zouaves in other militaries added to this prestige. However, an expedition to Mexico failed to create a stable puppet régime. For many years up to 19 military regions were active (see fr:Région militaire). 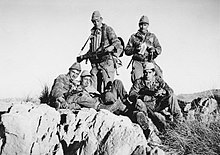 The 10th Military Region (France) supervised French Algeria during the Algerian War. However, by the 1980s the number had been reduced to six: the 1st Military Region (France) with its headquarters in Paris, the 2nd Military Region (France) at Lille, the 3rd Military Region (France) at Rennes, the 4th Military Region (France) at Bordeaux, the 5th and 6th at Lyons and Metz respectively. Each supervised up to five division militaire territoriale – military administrative sub-divisions, in 1984 sometimes supervising up to three reserve regiments each. Today, under the latest thorough reform of the French security and defence sector, there are seven fr:Zone de défense et de sécurité each with a territorial ground army region: Paris (or Île-de-France, HQ in Paris), Nord (HQ in Lille), Ouest (HQ in Rennes), Sud-Ouest (HQ in Bordeaux), Sud (HQ in Marseille), Sud-Est (HQ in Lyon), Est (HQ in Strasbourg). Contract officers serve on renewable contracts for a maximum of 20 years service. A bachelor's degree is required. There are two different programs, combat officers and specialist officers. Officers in both programs graduates as Second Lieutenants and may reach Lieutenant Colonels rank. Combat officers spend eight months at ESM, followed by one year at a combat school. Specialist officers spend three months at ESM, followed by a year of on the job-training within an area of specialization determined by the type of degree held. In the 1970s, France adopted a light beige dress uniform which is worn with coloured kepis, sashes, fringed epaulettes, fourragères and other traditional items on appropriate occasions. The most commonly worn parade dress, however, consists of camouflage uniforms worn with the dress items noted above. The camouflage pattern, officially called Centre Europe (CE), draws heavily on the coloration incorporated into the US M81 woodland design, but with a thicker and heavier striping. 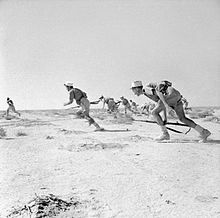 A desert version called the Daguet has been worn since the First Gulf War which consist of large irregular areas of chestnut brown and light grey on a sand khaki base. ^ "Version du décret avant abrogation" (in French). Legifrance.gouv.fr. Retrieved 25 January 2013. 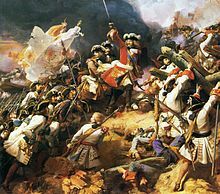 This page is based on the Wikipedia article French Army; it is used under the Creative Commons Attribution-ShareAlike 3.0 Unported License (CC-BY-SA). You may redistribute it, verbatim or modified, providing that you comply with the terms of the CC-BY-SA.